Meet Kathryn Gray, 10 year old girl who discovered a supernova!! Do you know who Kathryn Gray is? Who doesn’t? She is the youngest girl ever to discover a supernova, at a mere age of ten! (I cannot even remember what I was doing at the age of ten.) 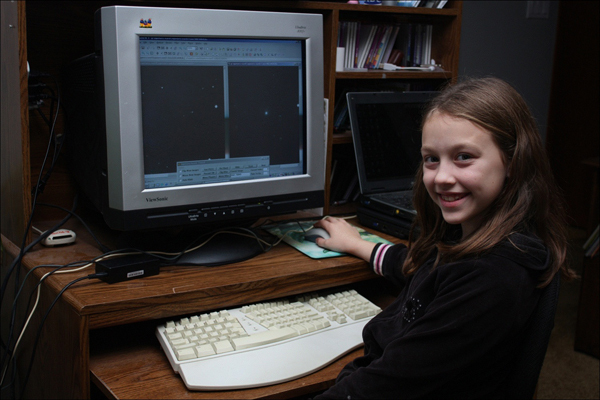 She is a young budding astronomy prodigy and lives right in Birdton, New Brunswick, Canada. (Yes! She is a Canadian!) Her father Paul introduced her to the world of astronomy and to his and everyone’s surprises, she was more than just a fan of the stars. It took Kathryn hundreds of hours to study and compare thousands of astrophotos, but she did it, on New Year’s Eve and rest was history. Initially I came across Kathryn’s story from reading SkyNews magazine (www.skynews.ca) and I was completely awed by this young girl’s motivation and effort. In due course, Pacific Telescope has the greatest honour from Paul and Kathryn Gray to conduct a short and casual interview at their home in Birdton. We wanted to get a first-hand experience on hearing her story and seeing how this aspiring astronomy prodigy is like in person. The video production is currently underway and we are expecting to release the video right here on our website towards the middle or end of November. Please stay tuned for this wonderful story video about Kathryn’s incredible discovery, proudly brought to you by Sky-Watcher.